Contact centres no longer carry the badge of “transactional cost centre” – they are a rich source of customer insights. 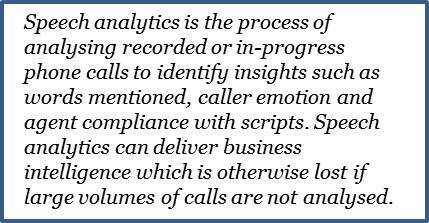 One of the most valuable ways of unlocking these insights is through analysing calls. But manual review of calls is a costly and time-consuming process, and most contact centres only review 1-2% of customer conversations – the insights in the other 98-99% of calls are left hidden. Speech analytics, which unlocks customer insights from mass volumes of calls, has changed all that, bringing big data into the hands of even small and mid-size contact centres. Speech analytics is a complicated, highly specialised technology hence many implementations fail to deliver on the promised ROI. (A six-figure budget is generally required to purchase licences, pay for professional services and hire staff to run the technology.) The team in charge of running a speech analytics program needs not just a technical, or quality monitoring skill-set, but an understanding of the psychology of why consumers react the way they do, how they make decisions, and how to deal with model errors inherent in the hit rates of the system. The good news is that speech analytics is also available as a service – whereby companies don’t need to purchase expensive licences or hire specialist resources, thus removing the risk. The only prerequisite for using a managed service is you need call recordings, metadata and a provider that can read your call recording type. While large enterprises with thousands of contact centre seats may be comfortable they have the requisite knowledge and talent to buy speech analytics licences and deploy internally, the as-a-service option is generally more suitable to small and medium-size contact centres, from both a risk and budgetary perspective. The as-a-service model also provides an affordable entry point to pilot speech analytics and build a business case for longer-term usage. There are three main types of speech analytics tools – phonetics, text-to-speech and grammar-based. Phonetics is the fastest approach to speech processing and requires the least amount of data storage; text-to-speech converts the entire call recording to text, and takes longer to deploy. There is also a difference in when the analytics is conducted – post-call or real time. Post-call or historical analysis is the most common, and is suited to deep-dive analysis of trends and mining of calls to identify customer service and compliance issues. If, on the other hand, your contact centre wants to set up supervisor intervention when certain words are mentioned (for example, swear words or words with compliance or legal implications), then real-time is a good option. Some vendors have few experts on the ground – ensure you can get the local support you need on an ongoing basis. Find out how the supplier’s technology deals with a range of accents in the local market. The impact of accents is underestimated in analytics deployments and is especially important in multi-cultural countries. Determine if the tool works in your environment and perform your own compatibility testing. Be sure to start with a small scope of work, test and retest until you have level of accuracy and then build upon that success. The most successful analytics engagements start with a proof of concept that delivers an ROI before moving on to identifying more complex issues. Buyers considering a managed service or cloud-based version of a speech analytics solution need to check whether data and call recordings are being stored or analysed locally or offshore. Some managed service vendors are not based in the countries they sell to, and offshoring data is something that can affect compliance with local privacy legislation and PCI-DSS. Send me more information on speech analytics as a service or contact us.